We find our heroic dwarf fighter, Broak, wandering away from the party to be by himself and cry into his beard while the other decide to take a short rest on the (assumed) safety of the secret sarcophagus chamber. Broak made his way out into the great forge hall where he sat and moped in the corner and questioned his lot in life. Close to an hour later, a small group of kobolds snuck up on Broak's position and launched an attack. Knowing his only hope was to escape back to his friends traveling companions, he started to fall back towards the secret door, felling kobolds as he went. 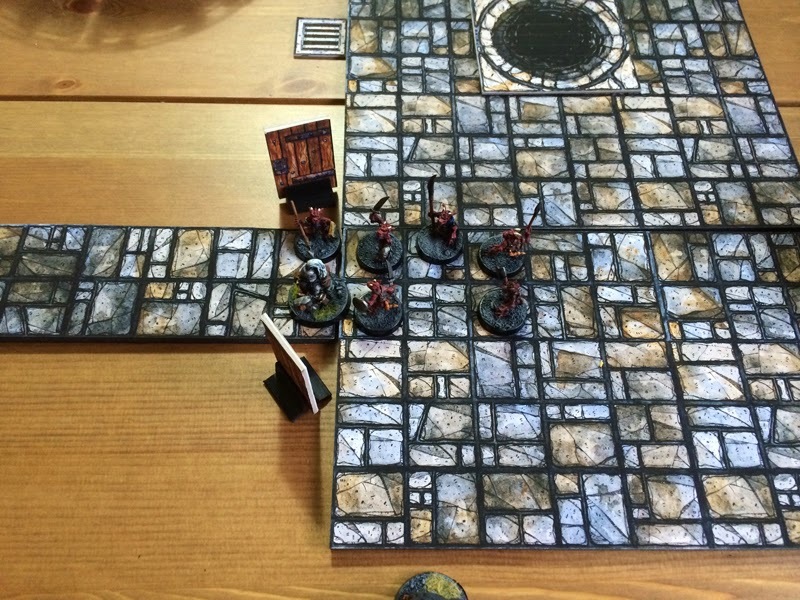 But even the somewhat mighty Broak was quickly overrun by kobolds as he tried to make his way down the corridor he suffered a bloody wound that weakened him and he fell unconscious, swarmed by yipping, barking kobolds—his allies unable to hear the melee through two layers of stone secret doors. As the party's rest drew to a close, Grabby's conscious started to eat away at him as he wondered what had become of Broak, could he leave his friend to certain death in the bowels of the Orespire Mountains? Boots was fine leaving Broak to whatever fate might meet him in the darkness, but Grabby managed to convince the others to go looking for him. Sliding the open the secret doors, they saw Broak's unconscious form on the floor in the hall, surrounded by kobolds looting him. Broak's allies rushed in to defend the helpless dwarf, killing and driving off the remaining kobolds, some of which managed to make of with Broak's backpack and warhammer (luckily Ander happened to have an extra). The group (except for Boots who stayed back in the secret room) helped Broak to his feet and helped back to the safety of the secret chamber where he patched himself up. The group, reluctantly together again, moved down the web-filled corridor to the north which turned to the east and ended in a secret door which led to a study chamber, its walls lined with shelves filled with hundreds of ancient and dusty tomes. To the south a crudely bricked up doorway was visible, and to the east was a short corridor that led to a set of doors. In front of the doors was the corpse of a long dead orc warrior, out of it's body grew an oddly shaped purple mushroom as tall as a man. Not wanting to get to close to the strange fungus, they decided to begin hammering down the bricked up doorway. Audrey made short work of the crude bricks, revealing a small chamber filled with tables and shelves filled with glass vials and other vessels, many of which were smashed about the room. At this point, they decided to deal with the strange purple fungus in the short hall. Ander let an arrow fly, striking the mushroom. Immediately the shrieker began emitting an ear-piercing wail that echoed off the stone walls. He fired more arrows at the fungus and its wailing began to subside. Withing seconds the sounds of a kobold force could be heard making their way toward their position, drawn by the sound of the shrieker. The party fell back into the alchemy lab in hopes of forcing the kobolds into a bottleneck. As they fell back, Audrey was left behind trying to repack her sledge hammer as kobolds opened the doors to the east and poured into the chamber. Left alone to defend herself, Audrey engaged the kobolds with her halberd, cutting through their numbers. Rushing to the aid of his friend, Grabby rushed out past Audrey to engage the kobolds head on. In doing so, as he weaved past Audrey, Grabby tripped over the barbarians polearm as she swung it, causing him to trip and fall forward, releasing his grasp on his magic dagger, Mr. Shiney, which skipped along the floor. Grabby's folly also forced Audrey to drop her halberd to the ground, which a kobold quickly grabbed and pulled it behind him. Even with an unarmed barbarian and a prone halfling thief, Ander and Boots managed to give enough support to finish off the kobolds. 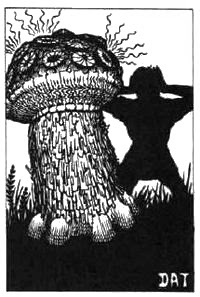 Once the dust had settled and they were sure the area was secured, Grabby—not wanting the possibility of food going to waste—grabbed a bottle from the lab, drew his dagger and approached the dead shrieker, sliced a piece off, to which his player proclaimed, "I stick my purple mushroom in the bottle!" Mushroom secured, the party sifted through the lab and found several jars of various coloured liquids that seemed to be inert potion ingredients. To the west was another short hall that ledt to another part of the lab. Again, mostly filled with smashed or empty glass vessels, but the party manage to find a few vials of potions. Broak was called in to read their dwarvish labels: Healer (x2), Dragon's Breath and Vapors. Note: At some point Boots found a scroll of Detect Magic in the study. Using the scroll, Ander ran back to the chamber with the animated iron statues, cast the scroll and only detected the statues—at some point they also destroyed one of the statues that they had seriously damaged in their previous encounter. Back in the alchemy lab he also detected a very faint source of magic from the ingredient jars, as well as the potions they found. I can't recall just where these things happened.